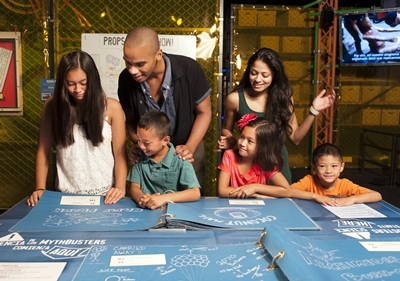 Uncover the truth behind popular myths by mixing scientific method with gleeful curiosity and old-fashioned ingenuity in Space Center Houston’s new summer exhibit, MythBusters: The Explosive Exhibition, presented by Coca-Cola May 28-Sept. 5. 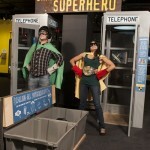 As seen in the Discovery Channel’s Emmy®-nominated TV series “MythBusters,” the exhibition creates hands-on, interactive experiences for guests of all ages by combining scientific facts with innovative, family-friendly displays. For 14 years, the TV show featured 3,000 experiments in more than 260 episodes and tested more than 1,100 myths before ending its run in March. “MythBusters” episodes can now be seen on “Science Channel.” The show’s co-hosts Adam Savage, Jamie Hyneman, Tory Belleci, Kari Byron and Grant Imahara took scientific investigation to exciting new levels by proving or exploding myths using their highly experimental approach and extensive backgrounds in special effects. Savage and Hyneman were heavily involved throughout the development of the exhibition to ensure guests experience a true MythBusting encounter. The Blueprint Room – Based on the real-life operations room of the “MythBusters” iconic set, this room acts as an introduction to MythBusting and is filled with gadgets, props, video and, of course, blueprints used by the hosts to explore myths on the show. The Workshop – This is the place where guests turn into investigators and use real science to test myths. Guests discover whether they get more wet running versus walking in the rain and find out if toast really does always land buttered-side down. A live “MythBusters” demonstration stage – Here guests have the opportunity to view and participate in live science demonstrations that dissect myths with the help of a team of energetic MythBusting facilitators. To plan your trip to Space Center Houston, go to the Visitor Info Page at spacecenter.org/visitor. Find helpful tips and suggested itineraries to help you plan your day. To enhance your visit, purchase the new Astronaut Audio Tour featuring first-hand stories from space pioneers, beautiful photos and exciting videos that tell the rich history and sparkling future of human space exploration. Save on admission with a CityPASS and explore Space Center Houston plus four other top attractions. Purchase a CityPASS in-person or online at spacecenter.org. Purchase a Space Center Houston membership for as little as $29.95 and return free as often as you like during the year with free parking, special events and much more. For more information, visitspacecenter.org. The exhibit was created by Discovery Communications and Exhibits Development Group (EDG), in partnership with the Museum of Science and Industry, Chicago (MSI) and Geoffrey M. Curley + Associates (GMC+A). “MythBusters” the series is developed and produced by Beyond Entertainment Limited. Financing for this exhibition has been made possible by Olympus Capital Investments, LLC, a unit of Olympus Holdings, LLC.